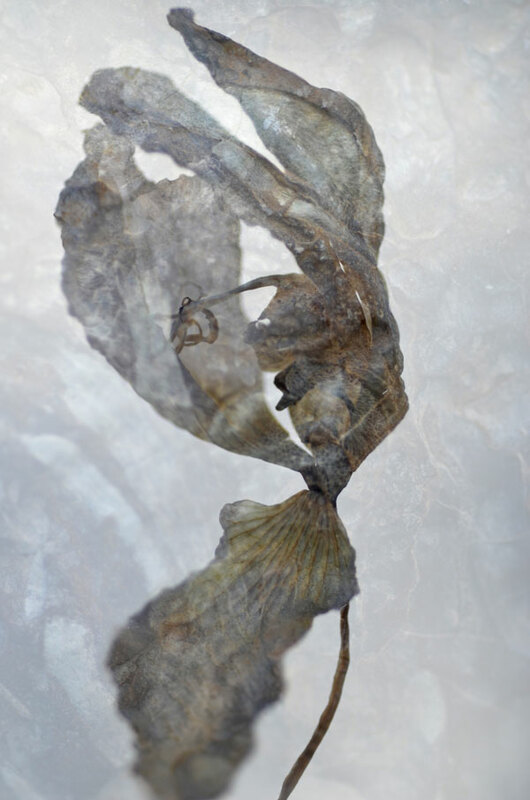 An image from a photographic series layering the ephemeral (withering flora) and the enduring (ancient fossils). This image is an in-camera double exposure. You may recognize the form of the orchid from the previous post. I was wondering if anyone would notice the bird – I think it might be a chickadee! This is an artistic and creative image Karen. Well done. A beautiful merging of sedimentary ghosts. Sedimentary ghosts – what a great phrase! Thank you, Elena. Thank you very much, Shari! how do you develop these? its not film is it? You are right, it’s not film. Some digital cameras allow you to take multiple exposures in-camera through a setting in the menu.. My camera will allow double and triple exposures. What kind of camera do you have? Really beautiful. For some reason, I see Mary Poppins plummetting to earth, having let go of her umbrella- tailcoats flapping behind her in the wind. That’s a fun interpretation! Thanks for your comment. What a fine balancing act – the plant retains its delicacy despite becoming a monument. This is really beautiful, Karen. Thank you, Richard. It is a bit of a balancing act technically speaking; Each exposure is carefully considered so that the flower form doesn’t just appear to be a shadow. It’s a lot of trial and error, but I like the idea of it. I am so glad to see someone take photography further and explore what can be done. These touch memory and mortality in their mood and execution. A breath of fresh, cold air. A lovely comment, Judy. Thank you! I never get tired of trying to find new ways to look at things – I’m happy you like the explorations. Wow, such a stunning image, Karen. a brilliant creation! Great work as always!! I’m glad you like it, Mimo. Much thanks! Strength and weakness. Weakness is always best: we are born supple, but strength and brittleness go hand in hand with death. A little (digital) magic. I can do in-camera double exposures with my particular camera. It is endlessly fun. I think this is lovely, and it has certainly got everyone thinking beyond ‘photo of an orchid’! I must confess, I could not ‘see’ the bird, probably because I can ‘see’ a swan in the top half of the image and this is overriding my impressions. Such a rich texture, so warm, to me…very comfortable, Karen.